In the future you'll be able to control in-car devices with just a glance of your eye. That's according to Toshiba, which claims its new driving facial recognition system will enable you to tune the radio, change the air con and also alert you if you take your eyes off the road for too long. 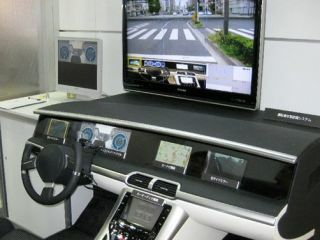 Toshiba demoed the tech at the Automotive Engineering Expo in Japan. The company says it isn't ready for the market yet, but it's working on making it more suited for embedded CPUs. It doesn't stop there: it seems light switches, TV remotes and even house keys could soon become a thing of the past too. According to reports, a new brain-computer interface tech is being developed that will let you carry out everyday tasks by thought alone. What could possibly go wrong? In other news, Segway inventor Dean Kamen has developed a shoe-controlled bionic arm. Essentially a foot-operated joystick, sensors in the user's shoe react to pressure on different parts of the foot, enabling the arm to be manoeuvred. It involves wires for now, but future versions will be wireless. Elsewhere, Houston researchers have linked CO2 poisoning to videogames. Scientists found that many of the children treated for the illness after Hurricane Ike had been playing videogames powered by generators. It seems that while some people used their home generators to preserve food until normal power was restored, others opted to run entertainment systems instead. We're not sure which is weirder – iXing's Vitamin MP3 player, a tiny pill-shaped gadget that "combines our hobbies of music, gadgets and prescription-strength home pharmaceuticals into one" (not to be confused with last week's Weird Tech-featured cyanide chip), or the speakers made from real eggshells that we saw this week. They must have taken Flickr user Gomhi ages to create. In fact, all manner of unusual devices surfaced this week. Thanks to the Powerbrella, you can now charge all your gadgets outside – and dodge sunburn at the same time: bonus. Basically it's a giant patio umbrella with solar shades, so you can simply plug in your gadgets to the outlets, grab a beer and enjoy the weather. Fear not, this isn't Washington launching a nuclear attack on the rest of the world. It is in fact a visualisation of mobile phone activity during Obama's inauguration, showing the world being lit up by millions of voices. Watch it in motion for even more spectacular results.